What Can Stop the Kiwi Crashing? Last week was not a good one for the NZD. After weeks of not knowing, the New Zealanders finally were able to form a new Government. However, it was the left-leaning party that managed to secure the numbers. This was taken as a big negative for the Kiwi dollar and it went tumbling almost 2%. Then on Friday, just to add salt to the wounds, the USD had a sharp rally when the Trump administrations tax reforms, started to get some traction. 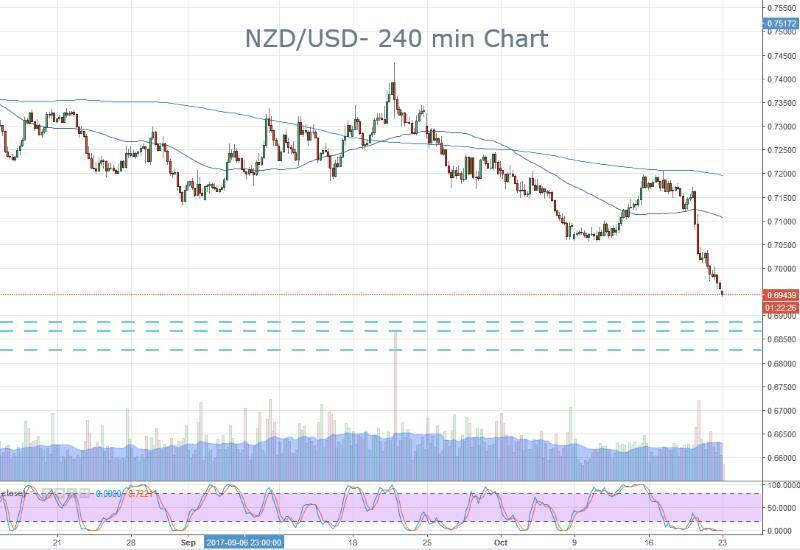 The only possible way to trade the NZD/USD at the moment is to the downside. As it stands the next support level (Swing low) is 0.6887. From there 0.6872 and 0.6821 are the next levels that might slow us down. As such we are getting a good reward on a continued downside move. I suspect the USD will continue to be strong so I think selling pullbacks is a very solid plan at the moment.